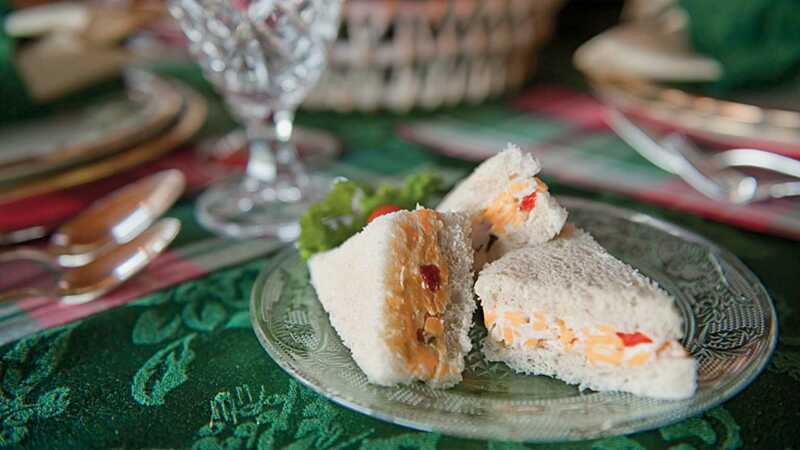 Enjoy country superstar Dolly Parton's recipe for Pimento Cheese Sandwiches. 1. Combine the cheddar, cream cheese, pimentos, mayonnaise, egg and cubed dill pickle in a medium bowl and mix thoroughly. 2. Spread on half of the slices of bread and top with the remaining bread slices. 3. Alternatively, spoon the cheese into a serving bowl and arrange crackers around it. Makes 6 whole sandwiches or serves 12 as an hors d’oeuvre. Nutritional Information (serving size: one whole sandwich): Calories: 420; Fat: 31g; Cholesterol: 115mg; Sodium: 700mg; Total Carbohydrates: 21g; Dietary Fiber: 4g; Sugars: 3g; Protein: 18g. Try more of Dolly's favorite holiday recipes, and don't miss her inspiring story about her family's Christmas traditions.